There’s a light wash of Basic Grey on the boards behind the sled, and those fat little birds are just waiting for you to look away so that they can swoop down and stuff their beaks with those juicy red berries!! 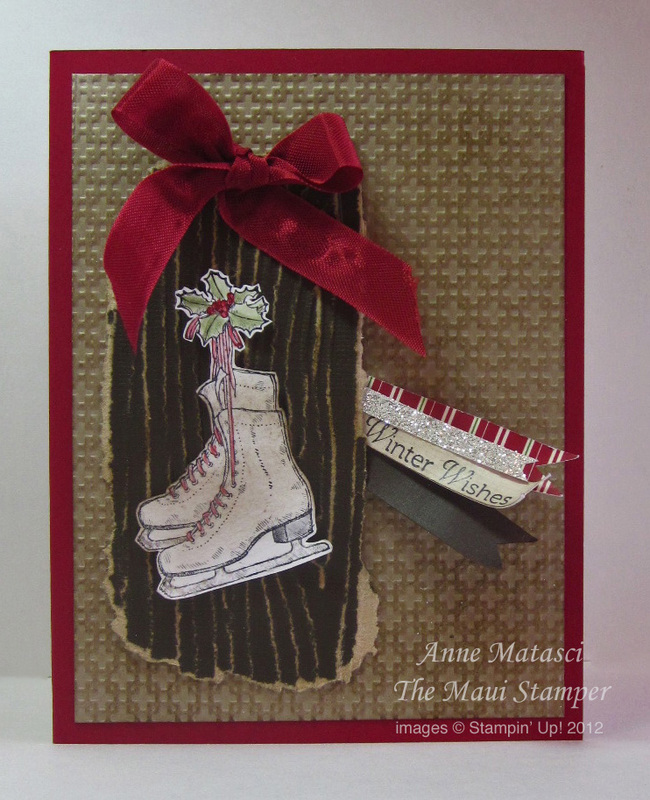 There’s lots of texture here with the Core’dinations paper, embossing and sponging. I’ll warn you that tearing the Core’dinations paper especially once it’s gone through the TIEF is kinda like plucking your eyebrows (sorry guys): it’s really easy to get carried away and then all of the sudden you’ve got nothing left! Love this set? 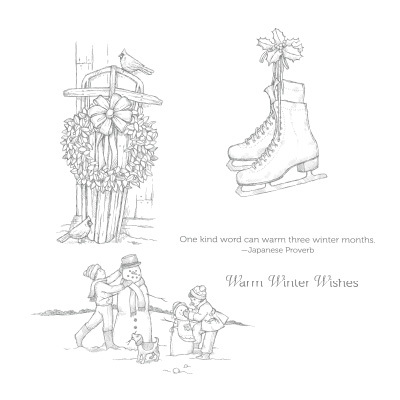 It has beautiful, detailed wintery images perfect for watercolor. Thanks for stopping by, and be sure you continue on to see what all the other RemARKables have to share. A hui hou! 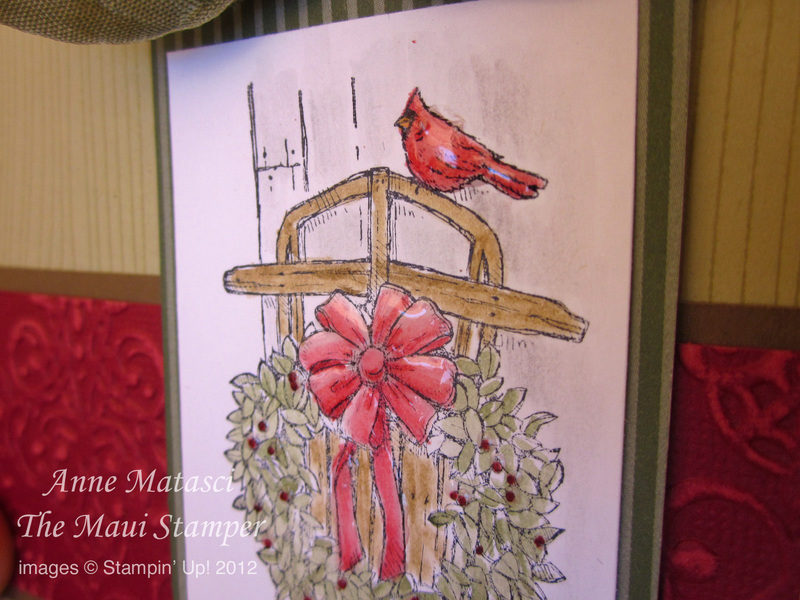 Love the watercolor, Anne!! Suitable for framing! Love you Cheryl – can’t imagine someone framing one of my cards but I love to consider that option! Love the coloring nice color combo. Well, Robin, if I ever need ice rink expertise I know you’re the one to call. The nearest rink is on Oahu, not so far as the bird flies but in fact you need to be a bird – or take a plane – to get there! Beautiful! I especially like the first one and how you tied it all together, especially using the wood grain background to tie it to the sled. Kudos! Jeannette, thanks for noticing – I really did think about the wood textures! 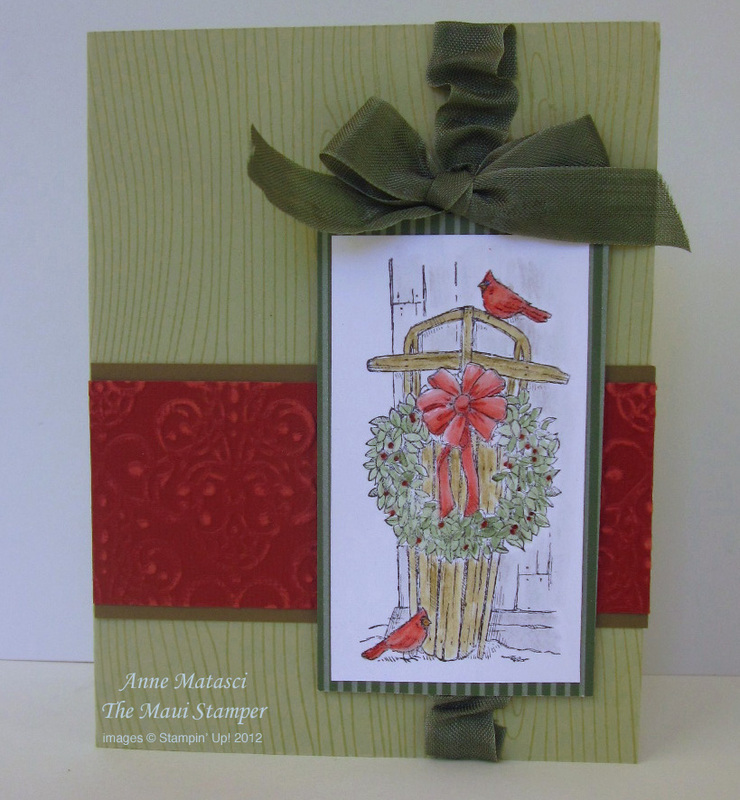 Anne, love your color combos and love how you used the Core’dinations paper!!!!! Thanks Becky – my dear friend – I do love that Core’dinations!! Thanks, Carol, I appreciate that!